Watch your prepared cakes and pies soar out the door with this 9455 cake / bakery box! This bakery box is also a great way to offer your smaller baked goods, like cookies and muffins, by the dozen for higher volume sales. The bakery box comes as a flat sheet for convenient storage, and assembles easily by folding and locking tabs together at the sides. A white exterior with natural brown interior and durable paperboard construction provides the perfect palette for your patrons to pick up some delicious baked goods to go. The 8x8x5 cake box is perfect for the currently popular smash cakes that use a 6" pan. Each smash cake uses one box of cake mix. It was a good deal to buy the 100 pack to last years to come instead of buying at the the craft store every few cakes. Very durable bakery box. I use these boxes for my smaller cake orders and also for treats like rice krispirs, and Oreos. Once they have been individually wrapped, they fit very nicely into this box. Nice! We use this box to put our 6 in round cakes in. The material of the box is good. it's not super thick, but definitely not flimsy. The only thing I recommend is make sure you clean out the sides where you're going to close the cake box. You want to make sure the brown paper from the side cuts does not fall on the cake. Maybe I'll make a video and post what i'm talking about. If you don't pre-clean the sides, little splinter looking piece of paper can fall onto the cake. Overall, would recommend and order again myself. These boxes are very easy to put together & their good quality! Will Definitely be ordering again. The best price around, also easy to store these boxes! The 8x8x5 box holds 2 dozen of our treats. The 5” height is perfect for use with the 4.5” lollipop sticks. We love the classic and simple look of this box. This box has a very good price and it's very practical when I have to put my cakes or cookies . I used a lot of times.. Perfect size for these cakes for twins. The boxes were easy to put together and travel very well. The pricing is great and will be purchasing more. These cake boxes are no fuss, sturdy contruction, and great quality for the price! Just make sure your treats don't touch the edges or you may get grease spots...but pretty much all boxes will show that. Wonderful product overall! This is a small box in the box world, but at 5 inches tall, it's great for making sure that your layer cakes are protected. Made from a sturdy cardboard, the crease lines make for clean folds. These boxes are fantastic! The 8x8 size is perfect to pack up multiple cupcakes. They are really easy to fold together and are very sturdy. These boxes work great for packing our 6” mini cakes or smash cakes. We add stickers to the plain white boxes for a professional presentation. I can't say enough good things about Boxes, this company really does boxes well. They are sturdy yet affordable. This size is perfect for those small cakes that are tall and need extra vertical space. Ordered another set of these boxes today. Yet another quality box, with a great price point from webstaurant. Will continue to order these boxes. Great for cheese cakes and 6inch cakes with a 8inch board. Very firm and dutiable boxes. The shipping is really realizable also you don’t get damage goods. Great sturdy boxes for such a great price. I use lots of this size since smash cakes are so popular right now. They look nice and professional. I have to admit,, i love these boxes. I mainly use them for my brownies or 6 inch cakes. THey are sturdy and holds well when used with cake boards. Worth the purchase. Not only are these boxes great for 6" cakes, they are the perfect size for a 9 cupcake sampler, which I provide to many of my "soon to be" brides. Great price and very professional in appearance. The perfect size for 6" cake. Very sturdy with the ability to stack if needed. Price is better than a number of other places I had looked at. Also love the ability to either have the white side or brown side out. Love to use this box for that very special 1st Anniversary cake, so that bride can take it home and freeze it for next yesr. All have said it holds up great too! Perfect height for my 6 inch round cakes. I don’t have to tape the lid open like some other boxes. Nice and clean look also. I use these boxes for my cake decorating classes. They work better than the 8x8x4 boxes since they are a little taller. Fully decorated 6 inch cakes fit perfectly. I love these. They are of a great quality and price. They work great for my cake classes. Ship fast and work great. I will reorder! These are perfect little smash cake boxes! I put a 5 or 6 inch smash cake on an 8 inch board and these fit perfectly! I was unable to find these size boxes in the stores, so I decided to order them. I use these for my smash cake orders and for smaller cake orders. Perfect fit. I will be ordering more soon as well as the other sizes. They are of good sturdy quality. I have found that these work perfectly in my bakery. I can send a variety of things out the door in them. They hold well, and are extremely sturdy. This box is pretty strong and i great price. Cakes fit perfectly inside and the box isn't flimsy. I also use these boxes to ship cake toppers. These boxes are great for transporting mini cakes. I use them for my 6 inch cakes, which are frosted on the 8 inch gold cake boards available on this website. These boxes are very sturdy and are of great quality. 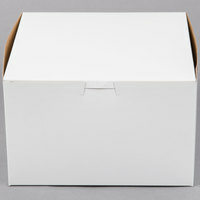 We are a bakery and the uses for this box are endless, cakes, pies, cookies, cupcakes and more! Great sized box for small cakes. It is sturdy and inexpensive. I would recommend this product. Love that it is taller than a 4 inch box. Especially nice boxes for small cakes and tall pies. They also hold a bunch of cookies. We keep some handy for people to take thing home from dinners, etc. This box is the perfect size for my 6 inch cakes. I love the little bit of extra height these offer so I don't have to worry about icing getting squished. The crisp white color makes for a nice clean presentation! These boxes are just the right size for my double layer 6'' cakes. I tape an additional 8'' cake board underneath them to keep the cake nice and snug inside the box so I don't have to worry about them sliding around during transport. great boxes! I use these for cakes, cookies and such. Great quality, very sturdy and they make for a great presentation. Definitely worth the price! This cake box served it's purpose. i do like the bulk ordering, a single cake box purchased elsewhere is lost money. It is also 5 inches tall which helps when you have decorations on top! These boxes are great for transporting your cakes safely. They are durable and easy to assemble. I will order again. The price is good as well! I have started making smaller cakes and these boxes are great for them. They're easy to assemble and they are the tallest I've come across in this size. This box is well made very sturdy material perfect for cakes , cake pops , candy pops etc. Package arrived quickly and well packed. 5 Stars!! great box that is our workhorse. the price is good and the quality is the same from our other suppliers at a slightly cheaper price when including shipping. These work great and an8" cake board fits perfectly! Not to tight not to loose but just the right size! It is easy to assemble and disassemble too! Ordered a 10 pack of these just to give them a shot and they are great! We're ordering the bulk sizes now because they're exactly what we need. Great boxes to hold and store small smash cakes, min cupcakes. and you can even fit up to 9 standard cupcakes in these boxes. They are sturdy and very easy to put together. They hold up really well too. I absolutely love these white bakery boxes. Easy to assemble, great color, and grease proof!! Makes all my bakery items just pop when displayed in the. Love being able to order small amounts of cake boxes and in different sizes for the small businesses. They are very sturdy and make your finished product look professional. I like these boxes a lot for random deserts that I make. They are not grease proof on the inside (if that even matters to you) so I lay down a piece of parchment and that works great. They are easy to put together and stay together well. This cake box is perfect for a small cake such as a 6 inch or simply to store or transport cookies! Plus, the hight gives you space for toppers or tall cakes, I highly recommend! Love these boxes! They are so easy to put together and once put together, they actually stay together, unlike most boxes that have to be held together by tape! Definitely recommend! These boxes have a nice tight fitting lid with locking sides and top. They are light weight and sturdy without being too bulky to handle. I use these boxes for my six inch cakes and they fit an eight inch cake board or circle perfectly. Perfect height when using extra frosting. I use this cake box for all my 6" layer cakes and they fit very nicely allowing enough room with deco to close the lid. Good quality, great price! I love this sized boy. It's pedect for me to fit twenty four cookies into or nine cupcakes. You can't beat this price either. I use this box more than I thought I woul! This cake box is perfect for 6 or 8 size cake. Several customers are unable to eat a 10 or 12 cake. So if you like to cook a smaller cake, this box is excellent for cakes strawberries, cookies, or brownies. These boxes are perfect for my business. I put my 6" cakes in them and it's a perfect fit using the 8" cake circles. They are quite sturdy. Very sturdy and wonderful. Love the size..... just perfect height for my desserts with decorations on top. Good for my cooking class too. I will be purchase more again. This is a simple, sturdy cake box. I use it with 8" cake boards (mostly for 6" cakes) for a snug, safe fit. No complaints. This is our standard box for 4 of our signature size cupcakes. It can hold six if it must but it will be a tight squeeze. Great boxes! The boxes are sturdy and easy to assemble! I will definitely purchase more. Amazing product. I really enjoyed these boxes for my cakes. Must get! These are the perfect size for an 8 inch double layer round celebration cake. They're also perfect for holding 6 king sized cupcakes! Can't beat the price! Great cake box. Made specialty heart shaped layered cakes for Valentine's Day! And these were PERFECT. Cakes fit with no issue, and Boxes were very sturdy. Will order again. Just the right size for my smaller cakes Price is great, make the cakes easy to carry in the car. would recommend to any one for cake delivery's. This boxes are convinient and affordable. Four stars because come times they are hard to put together, they get stuck because they not cut all the way. These bakery boxes add a professional look to your cakes and baked goods. The extra height leaves room for decorations on top of your cake as well. These boxes are the right size that I need and they met my every expectation! They're durable, stay together easily and are a great price! These boxes perfectly fitted four medium sized cupcakes each and suited all the needs I had. They are a pretty good bang for your buck as well so give them a shot! I know you'll enjoy. This box is great. Only thing is the box doesn't stay put together. I taped it up so its worked out good. I still would recommend it. It's great to be able to buy bakery boxes in small quantities when you need a specific size. These ones are a great thickness. Very sturdy. These are the best boxes, very good quality. At such a great price. I will not get any other of these kinds of boxes anywhere else! They have all the sizes you need! i was very pleased with the quality of this product. It was perfect for packaging my goodies. I will definitely be ordering again from this company! I received my bulk order of boxes and was anxious to use them. I was more than surprised at the great quality of boxes. Totally met my expectations for the price I paid. I got these for 6" cakes that i make as well as some jumbo cupcakes, they are great quality, sturdy and professional looking. My cakes and cupcakes fit great. Great little box, very easy to customize with a sticker and are a perfect match for the gold laminated cake boards that are sold here. Perfect boxes for all my cakes when I use an 8" board. Nice and roomy! I have also used these boxes for other baked goods. My go to boxes! I use these boxes for all my 6" cakes on 8" boards. They fit well and the 5" height is crucial to my tall cakes. I'll continue to buy these for all my packaging needs. I love buying my bakery boxes here. I like the bundles of 10 for some reason. I think the value is much better than buying the boxes individually, and I don't used them often enough to purchase a pack of hundreds. The cardboard is thick enough not to crumble by the weight of your cake, but not so stiff it's hard to fold. Overall, it's a great cake box and works as it should. These are great cake boxes. I always buy my boxes here because they are sturdy, well made and give my products the professional appearance they deserve. Because they are economical, they help me provide my customers with a product they deserve at a price they can afford. These boxes are a great addition to my inventory. They are just the right size for taller, smaller diameter cakes. The quality is good, and they look professional. I love love Love these boxes. They are very sturdy.. I also like that you have the option to purchase 10 boxes or 100. Thank you webstaurant. These boxed hold a 6" cake on a 8" board. They are sturdy, reliable and you can't beat the price! Want to make them stand out? Turn them inside out and voila! Kraft paper boxes! These are Great boxes at a great price. Assemble easily and are sturdy. Nice and white and a great deal for the money. Other websites charge double! I bought these boxes for 6 inch decorated cakes. They fit an 8 inch board so it's great for a 5 or 6" cake on that size board. THe cakes board fits singly and doesn't move around. This box is easy to 'assemble', it is sturdy, and fits an 8" cake circle perfectly! Just what I wanted, and such a great price! Perfect box for cookies and cake pops (4" stick or smaller). I use these all the time and have stickers and business cards I tape/place on the top. They're great for my little baking from home business. Good quality cake boxes that hold up to a 6" cake with room for the board. I love that these boxes are nice and tall so I can put my layer cakes in them. I have ordered these boxes several times. They serve a duel purpose for my bakery. I use them for for 6 inch cakes on 8 inch boards and I also use th for cookie. Sturdy and versatile. Very affordable boxes that are super easy to assemble and look great. I love that they are five inches tall so I can deliver wedding cakes in them. Perfect for 6 inch or smaller cakes. I took a chance ordering these but have been pleasantly surprised. Very sturdy & cakes fit in nicely with plenty of room. I ordered the smaller amount but will order more next time. These boxes are easy to assemble, they are sturdy enough and give a professional look when delivering cakes to your customers! I also love how affordable these boxes are! Nice and sturdy boxes. Sized perfectly for smaller cakes and pastries. I wish I would've ordered more. The white exterior looks great when covered with a colored ribbon and curled. Smaller cakes fit securely in this 8x8 box. The 5" sides allow for taller cakes and the box itself is sturdy! Very happy with this purchase! We use this little box to send out half dozens of our fresh baked muffins, they fit well in the box and it holds up well. We go through a lot of these boxes. They are a handy size and fit small cakes, several scones, a few jumbo muffins, or 4 cupcakes when we put the cardboard insert in. Sturdy and easy to close. These boxes mak transporting my cakes very easy. They are sturdy and good quality and they are simple to use. The next time I order I will purchase more. These Boxes are good for cupcakes, and small cakes but it is not very sturdy and it can be difficult to close, especially if you have a cupcake insert inside. These boxes are nice for the price. They are pretty sturdy when put together. I use them with cupcake inserts and the inserts fit but seem to have a little too much wiggle room. They are great for packaging other items, though! I love these boxes and they are very very reasonable price. I use these often for my strawberry shortcakes and small personal cakes. Must Buy!!! Nice sturdy cake box easy to assemble. We use these for our 6 inch or smaller cakes. Being 5 inches tall allows us to fully decorate before putting in the box. As always another good product from The Webstaurant Store. These boxes are sturdy and well made. They fold together nicely and my label looks good on the boxes! we ordered a small quantity of different size boxes, and love the variety of sizes and dimensions available. there's sometimes an issue with the inside flaps from the lid interfering with the product inside, but we found that you can put them outside and tape sides down. I like these 8 inch by 8 inch cake boxes! they are the perfect size and height for standard round cakes! Good for holding bagels and donuts too!! We use this box more for cookies and french macarons. Sturdy design keeps you from worrying about the security of your products. The dimensions don't allow use to use a cupcake liner. WE LOVE THIS BOX FOR HOUSING OUR 8" LAYERED CAKE ON A 10" BOARD. JUST ADD YOUR OWN PRINTED LABEL TO THE TOP. THE QUALITY AND CONSTRUCTION ARE GREAT! These boxes have been great. They are easy to store and easy to assemble which are both concerns due to our limited space for extra items. This is a great box for more than just cakes. It perfectly holds two ounce cookies and dresses up nicely with grosgrain ribbon. It is also very easy to assemble. Great quality product, easy to assemble, and hold up very well. Has a nice sheen on the surface, very professional look. I can assemble the box and tear it down and re assemble it over and over with out tearing the box. Very good height, I normally make cakes a bit taller than others and this box is wonderful for taller cakes. This is box is a great size for a 7-inch or a 6-inch round cake. It is sturdy and it is a good price. One thing that was not true to the picture was that its interior is gray not brown. I like to invert the box so that the inside shows, and I look for brown interiored boxes in order to do this for a more natural look. Other than that, this is a good box. We have been looking for taco and salad boxes. It was an ideal box for both our items. Customers appreciate such care and the shell does not break either. We use it for muffins and pasteries too.